Jeep Grand Cherokee SRT8 review | What Car? What is it? The latest Jeep Grand Cherokee has impressed us in diesel form, but this new SRT8 model is a different prospect. The high-performance flagship of the range, it gets a dramatic exterior makeover and a 6.4-litre V8 engine. It's also the most powerful car ever to wear a Jeep badge, producing 470bhp (up from its predecessor's 414bhp). What's it like to drive? 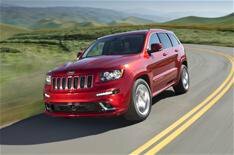 Despite its considerable size and weight, the SRT8 is seriously quick. Jeep quotes a 0-62mph time of 4.8 seconds and a top speed of 158mph, although the average economy of 16.8mpg won't encourage you to fully exploit this performance. The big Jeep handles itself well when you start to drive more enthusiastically. It feels planted, giving the driver plenty of confidence to push on through corners at noticeably higher speeds than you would in a Range Rover Sport. However, improved feedback through the steering wheel would improve things, as would a better automatic gearbox: the five-speed 'box isn't as good as some rivals' six-, seven- or eight-speed transmissions. There is little road or wind noise, and the ride is good especially so considering the SRT8's chunky 20-inch alloys. What's it like inside? Jeep's interiors have rarely lived up to those of their prestige rivals, but here the new SRT8 is much improved. The interior build quality is certainly better than anything we've seen in previous Grand Cherokees, although some of the plastics and materials could still be better when compared with a Porsche Cayenne's or Range Rover's. The paddles behind the steering wheel are also small, and need to be flicked with your index finger to avoid operating the stereo control buttons that are just below them. The blue-rimmed dials are a nice touch, as is the carbonfibre-look trim and the leather and Alcantara seats. The SRT8 is also packed with equipment, including heated and cooled front seats, a heated steering wheel, heated rear seats, panoramic sunroof, electric tailgate and a reversing camera. While few SRT8 owners are likely to treat their cars like a hot hatch, the trip computer also features an automatic stopwatch to constantly measure your best and last 0-60mph times. A further rotary knob just behind the gear selector allows you to switch driving modes between Track, Sport, Auto, Snow and Tow, to alter the suspension accordingly. Should I buy one? With mean looks, acres of road presence and guaranteed exclusivity, there's lots to recommend the Jeep Grand Cherokee SRT8, before you even get to how it drives and that superb engine. Like its performance 4x4 competition, however, the SRT8 is only ever going to attract a fraction of buyers compared with its turbodiesel stablemates. An appealing car, then, but prepare to be on first name terms with the staff at your local petrol station.